Millard Fillmore and middle school: Enough for a sit-com set in Buffalo? Buzz in Buffalo, New York, is that there may be a sit-com coming, set in Buffalo, about education — the kids and teachers at Millard Fillmore Middle School. Do you remember the last time that Buffalo had a sitcom “based” here? Do you recall what the name of the show was? It was Jesse – a show that ran for a couple of years (1998-1999). Since that time there has not been a show “set in” the city of Buffalo. But Jordan Imiola wants to change that. Jordan is currently a screenwriter in LA, who lives and breathes Buffalo, as does his girlfriend. They are huge Sabres and Bills backers, and do their part to expound Buffalo’s virtues whenever they are able. Sometimes they do that by frequenting Buffalo backers bars, and sometimes they simply wear it on their sleeves (both of them sport Buffalo tattoos). This is the age of the internet: You may contribute to the production of the series, at IndiGoGo. “Millard Fillmore Middle School”–It was named Millard Fillmore Jr. High when it opened in the early sixties. Located on Appenheimer St. off Fillmore Ave. next to the now demolished Kensington Heights projects. My Alma Mater class of ’66. There was an amazing teacher there, Mrs. Stallings, a black woman who for many of the white kids that lived in our all white neighborhood at the time, was the first contact we’d ever had with a person of color. She was so strict that no one dared not turn in their homework or disrupt the classroom. We all ended up with a 90 point or higher grade upon leaving her class along with the feeling that she was one of the best educators we’d ever had. I think that could be material for an interesting TV show. Millard Fillmore: Ready for his closeup with CBS Sunday Morning? Millard Fillmore as “Bad President,” by jimmyemery at deviantart. How will Mo Rocca’s story portray Fillmore? If other news doesn’t interfere, Millard Fillmore is scheduled to get a Presidents Day treatment from reporter and humorist Mo Rocca, on CBS’s “Sunday Morning with Charles Osgood,” on February 16. What a fine collision! Fillmore’s story is really pretty good. Osgood and Sunday Morning are top of the genre. Rocca is smart, and often funny. Even if they perform below their par, the segment should be enlightening. If you’re tired of me telling you how wonderful “CBS Sunday Morning” with Charles Osgood is, better look away now. Correspondent Mo Rocca — whose chicken wing piece ran on Super Bowl Sunday — is back again this Sunday with a piece on President Millard Fillmore. Rocca visited the Fillmore home in East Aurora on the same week he was here to sample chicken wings. “Sunday Morning” airs at 9 a.m. Sundays on Channel 4, the local CBS affiliate. The timing of the Fillmore piece makes sense since this is President’s Day weekend. Prof. Welch delivered the annual address at Fillmore’s grave this year, on Fillmore’s birthday, January 7 (delayed a couple of days this year because of cold and snow). “Sunday Morning” runs from 8:00 to 9:30 a.m. on KTVT, Channel 11, in Dallas. I’ll be ringing bells, and I’ll have to record the show. Check your local schedule. You could do worse on Presidents Day Eve than to learn something more about Fillmore, arguably the man who set up World War II in the Pacific. That’s something even H. L. Mencken didn’t blame Fillmore for. 36 years ago? Grouch Marx died on August 19, 1977? That means that not only have your high school history students probably never seen much, or anything, of Groucho Marx and his comic genius; it means their parents don’t know him, either. Groucho Marx brought genius to American comedy films, to radio, and then to television. His genius was of a sort that does not age, but remains fresh to audiences of today — get a group of teenagers to view Duck Soup or A Day at the Races and you’ll find them laughing heartily at even some of Marx’s more cerebral jokes. It is symbolic that the films that brought writer Norman Cousins to laughter, and a lack of pain, were Marx Brothers movies (in the day when one had to rent a projector to show the film, long before VCR). Cousins went on to a grand second career talking about hope in healing, starting with the book, Head First: The Biology of Hope and the Healing Power of the Human Spirit. I recommend these films to anyone seriously injured or ill, or recovering. We got VHS, and then DVD copies of several of the films when our kids were ill, with great effect. Groucho Marx should be in the pantheon of great Americans, of the 20th century, if not all time, studied by children in high school, for history and for literature purposes. Groucho’s been gone for 36 years, and we are much poorer for his passing. Every kid should have an opportunity to do this stuff. This promises to show Scouting in its better works. Are You Tougher Than a Boy Scout, On the National Geographic Channel starting March 4, 2013 at 8PM eastern time. Windom may have been surprised at being called either rich or famous — but he should have been. William Windom, an actor whose face and voice most Americans would recognize, died yesterday. I became a fan of his years ago when he starred in a short-lived, quirky and ground-breaking television series, “My World and Welcome to It.” The series was based on the work of humorist and cartoonist James Thurber. Windom played a cartoonist whose drawings occasionally came to life, complicating his troubles with job, women and family. The program ran for one season on NBC, 1969-70, with 26 episodes. Too few guffaws for network television. 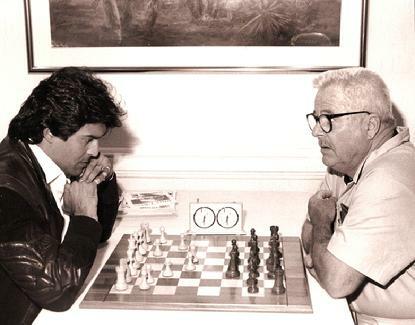 Buried in most notices of Mr. Windom’s death was the information that he was a pretty good chess player. A few of his games got captured on film. 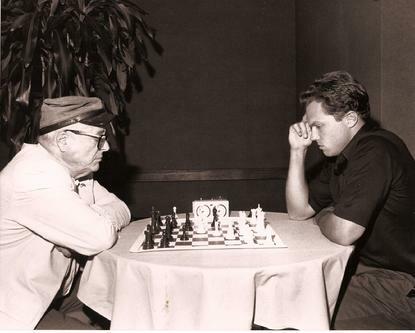 William Windom, left, playing chess against John Wayne – image from Batgirl at Chess.com. 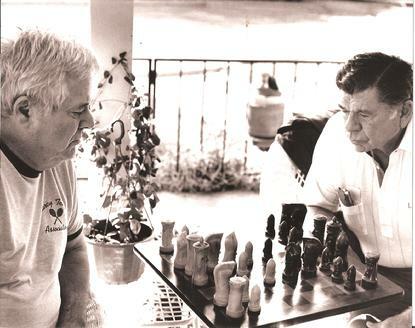 Wayne, known to friends and the chess world as Duke, played chess on almost all of his movie sets, and at least once in a movie role. Windom’s game against Wayne is undated. In this promo for “My World and Welcome To It,” one may get the idea NBC didn’t know what to do with the show, how to market it. The first personal computers were more than a decade away. Today’s teleprompters — a computer screen mounted to reflect into a glass in front of a television camera lens — had not been conceived. 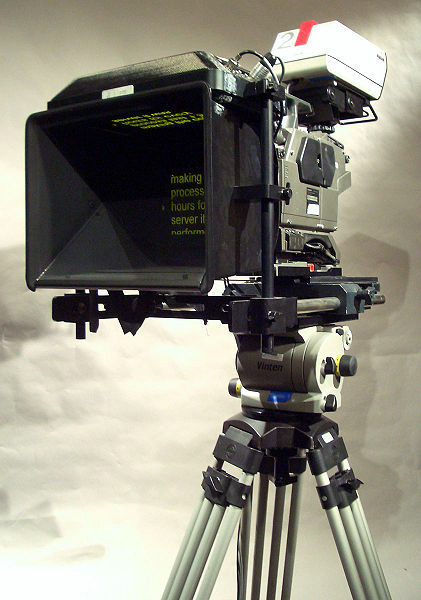 Teleprompters were cathode-ray tube televisions attached to a massive television camera with a clunky device. The image would be reversed to reflect correctly. Into that television would be a closed-circuit feed of a scrolling piece of paper on which was typed, in very large letters, the script the speaker was to read. In this case, of course, the speaker was the President of the United States, Lyndon B. Johnson. 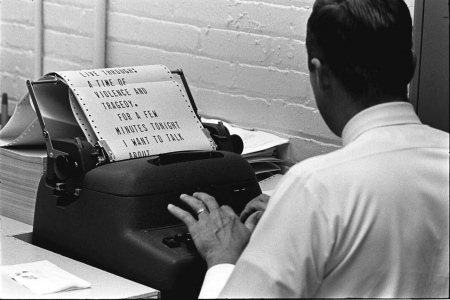 In 1967, a special typewriter was required to type out the oversized-font, easy-to-read script on a roll of paper with sprocket holes along the side to enable an automated scrolling. Just looking at the equipment for the technology of the time is an education. 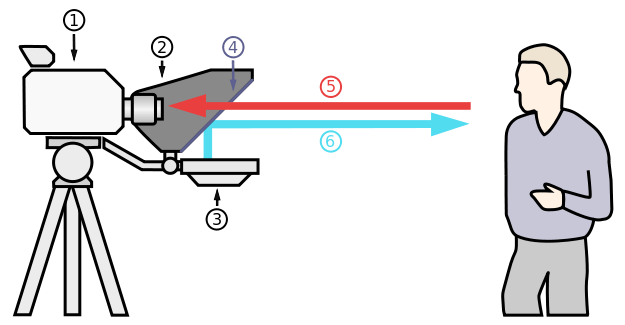 Teleprompters allow someone reading a script to look directly into the television camera lens, giving an impression to a viewer that the person is speaking directly to them, instead of glancing down at a script and back at a camera. Research showed viewers tend to grow disinterested in people looking down at a script, and would more likely be engaged by someone appearing to look at them. 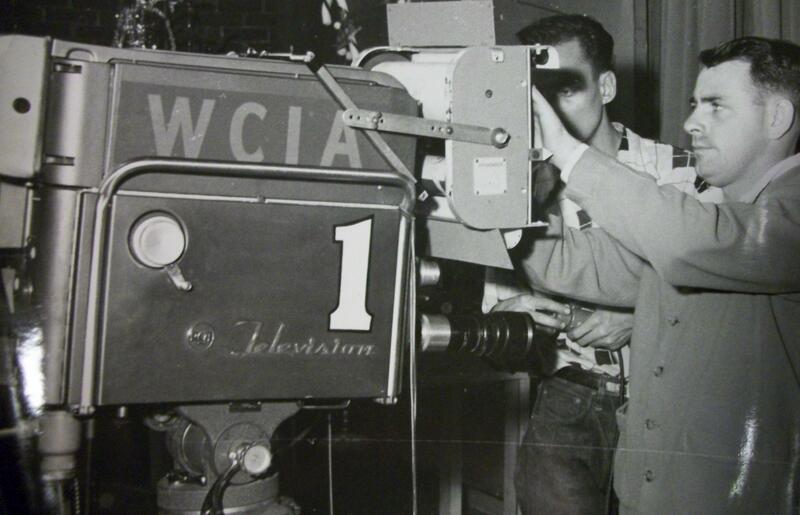 Teleprompters existed in the 1950s, but many local television stations did not use them until into the 1960s — news broadcasts of the time often featured the anchors reading from written scripts on a desk in front of the broadcaster. 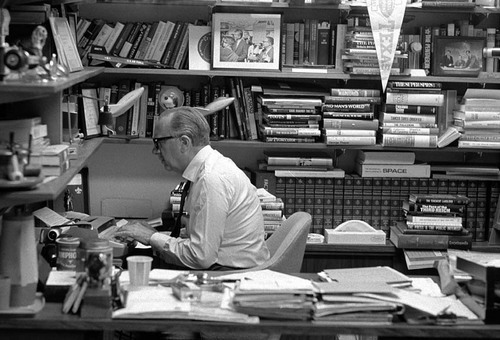 A few intrepid news anchors, throwbacks to a more theatrically-inclined era, would memorize an entire script every night. The schematic is based on modern, smaller television cameras and modern, thin devices to project the word images. Older versions were larger — sometimes much larger. One popular version put a simple paper scroller mounted above the lens of the very large, studio television cameras — a broadcaster’s eyes could focus an inch above the lens, and viewers couldn’t tell he or she was not looking directly into the lens. Teleprompters emerged as a symbolic political whipping device in the early 21st century. Partisans wishing to impugn the intelligence of a politician complain that he or she cannot speak extemporaneously, without a script. Oddly, the charge was rarely leveled at President Ronald Reagan, famous for his use of scripts in almost every situation. Reagan’s White House pushed modernizing of the technical devices employed at the White House, including the latest in teleprompter devices. 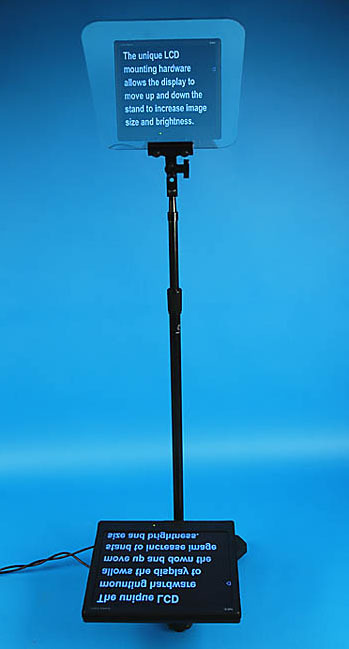 The most frequently-seen politician-used teleprompters today are simple stands, “conference” teleprompters, designed as much to allow a speaker to use teleprompters with a live audience as to facilitate television use. The devices are simple stands with a highly-reflective, clear plastic or glass on the top, and computer screen on the floor shining up. A modern, “conference” teleprompter of the style usually seen at public appearances by politicians. Modern teleprompters cost a fraction of earlier versions. Everybody uses them now — I’ve even heard of first-time candidates who did not have to go to teleprompter school. 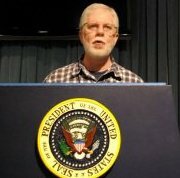 Here I am trying out the teleprompter and podium at the George H. W. Bush Library and Museum, College Station, Texas, in 2011. And more people using teleprompters, with years in captions, so far as I can get them. 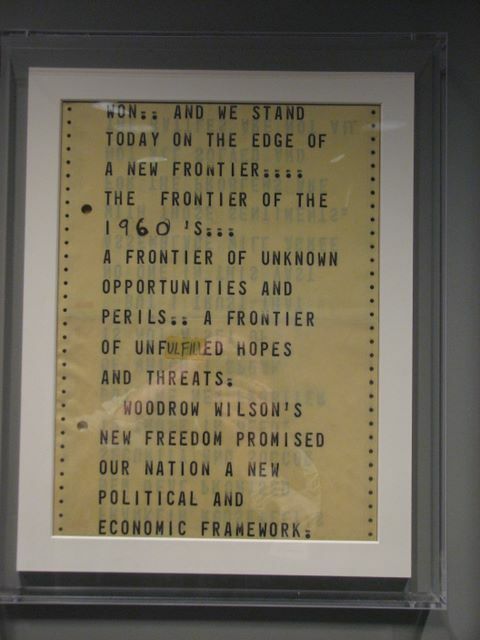 Teleprompter script used by President John F. Kennedy, from Kennedy Library collection; image by a private party. President Reagan often used teleprompters — in a computerized form by then. Teleprompter in use: In the White House East Room, President Lyndon B. Johnson used a teleprompter to address the nation in a live television broadcast, just before he signed the 1964 Civil Rights Act. 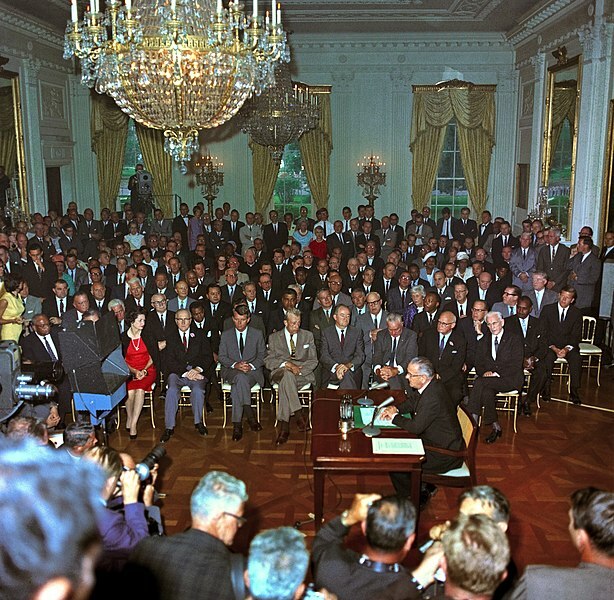 People watching include Attorney General Robert Kennedy, Senator Hubert Humphrey, First Lady “Lady Bird” Johnson, Rev. Martin Luther King, Jr., F.B.I. Director J. Edgar Hoover, Speaker of the House John McCormack. Television cameras are broadcasting the ceremony. 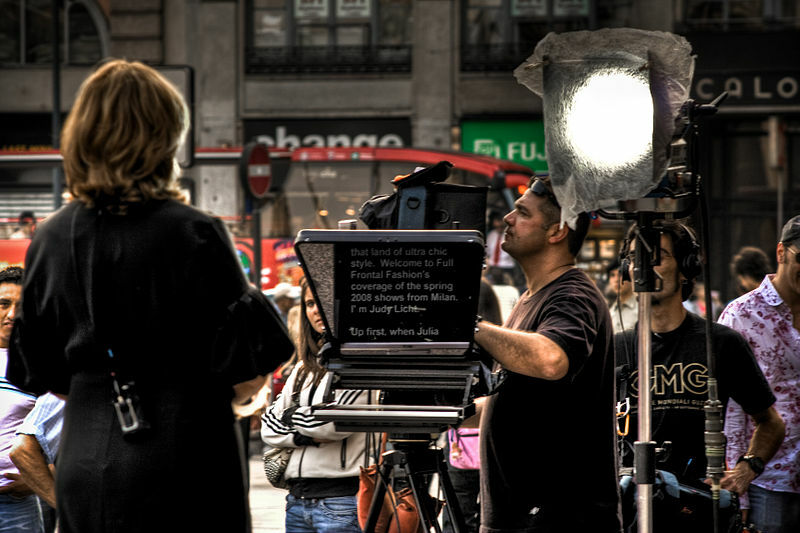 Broadcaster Judy Licht using a teleprompter in broadcast or taping from Piazza Duomo, Milan, Italy, in September 2007. 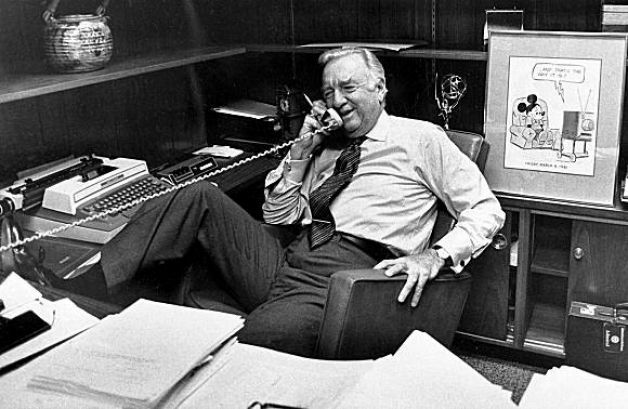 Walter Cronkite died on July 17, 2009. I miss his broadcasts, still, and they were gone a good 20 years earlier. Pipe rack to his left, on the shelf above; full set of the Encyclopedia Britannica to his right (probably a 1960s set); A lot of books, some dealing with space exploration, among his favorite topics; models of the X-15 and early versions of the Space Shuttle; award from the Boy Scouts to his right, where he can see it easily. When was this photo taken? 1970s? Earlier? Maybe someone who follows Dixie Cups could date the cup to Cronkite’s left.